Every public cloud, however, is different. GCP is rapidly gaining users among companies of all sizes. Today, GCP’s customers include large global brands like Disney, eBay, HSBC, The Home Depot, Schlumberger and Verizon, and smaller ones like gaming platform Smash.gg and the Rhode Island School of Design, one of the nation’s leading arts and design institutions. Whether GCP is a good fit for your company depends on a multitude of factors. 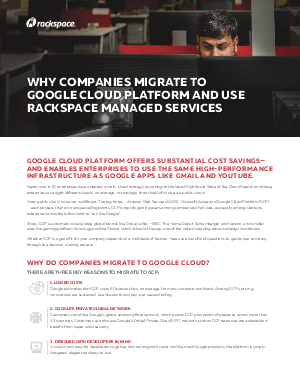 To find out what these are and how Rackspace can help your business, download this whitepaper today.